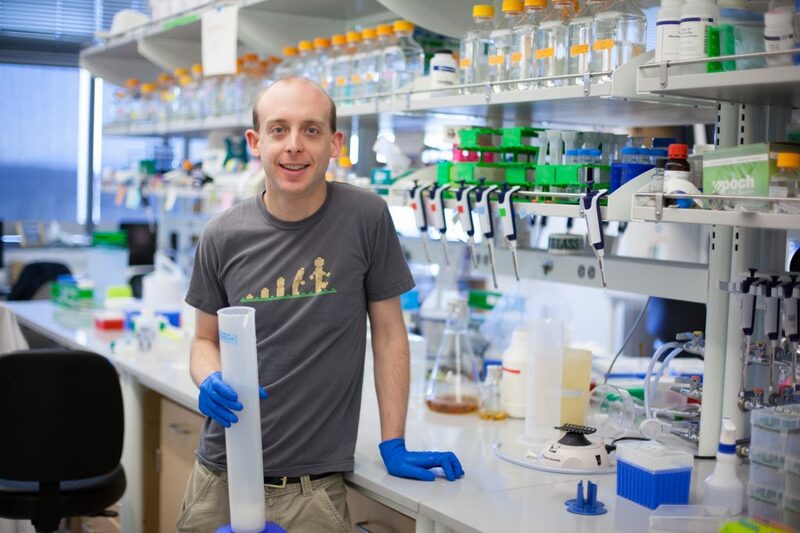 After fundamentally changing how we design proteins at the IPD, Gabe will soon start his own lab at Northwestern’s Center for Synthetic Biology in Chicago. In the 1990s, Silicon Valley produced a lot of computer nerds. Gabriel Rocklin admits he was one of them. But perhaps because he fit the computer nerd stereotype so strongly, he began looking for something else to do. Gabe considered a career in patent law while a student at Claremont McKenna College, a liberal arts school in California which focuses on government and economics. Becoming a patent attorney would let him combine his interest in science with his passion in law and policy, developed through years of debate tournaments in high school and college. “I love debate, and debating.” Gabe says. “And I have friends who did go into patent law.” His interest in science was cemented by two summers as an undergraduate researcher studying immunology at The Scripps Research Institute, and Gabe decided to join UCSF for a PhD, co-advised by Brian Shoichet and Ken Dill. Law school never happened for Gabe. Instead, under the tutelage of two accomplished computational biologists, he took a modeling approach to predicting protein-ligand binding affinities. He also discovered that he loved being surrounded by other scientists, and that seemed like a good reason to build a career in science. Gabe came to the Baker lab as a postdoc in 2013. Determined to strengthen his skills in the wet lab, he designed and tested six new proteins for his first project. All of them failed to fold. This pattern was far from unusual at the time. Although the field of protein design was beginning to accumulate successes — including, notably, Top7, which put the Baker lab on Gabe’s map — each success story was marred by a ugly backdrop: most designed proteins never properly folded. Success rates were uniformly low. “I recall hearing a talk in grad school that really stuck with me. The speaker said we should find the bottleneck in our fields and focus on that,” Gabe says. One bottleneck in protein design at the time was clear: no one knew how to identify good designs. If six new proteins scored well in the computer, only one — or even none — might actually fold. At the same time that Gabe’s designs were failing, Baker Lab grad student Aaron Chevalier and postdoc Chris Bahl realized that it would be possible to test thousands of designed proteins, as long as those proteins were small enough to fit on a single oligo. Bothell-based CustomArray, Inc. was willing to sell over ten thousand oligos as a pool, but each could only be 170 bases long. Aaron was planning to use these tiny genes to design flu binders. Gabe realized that this method could also be a powerful approach to studying folding, if only he had the right assay. When he arrived in the Baker lab, Gabe was interested in creating enzymes. He had not considered leveraging his unique strengths (or recent breakthroughs in DNA synthesis) until he was pushed by his advisor into meeting another postdoc. Just before leaving the lab, the other scientist suggested that Gabe read up on the work of Tom Magliery. “The idea of using protease as a high-throughput screen came from reading a review by Magliery. Many labs developed protease screens in the ‘90s, but you could say the approach had gone into hibernation, waiting for the era of next-generation sequencing and oligo libraries,” Gabe says. This insight led him to design over 12,000 new proteins with lengths under 50 amino acids, including thousands which he predicted would never fold. Many of the control miniproteins had the same amino acid composition as true designs but with sequences that had been scrambled. Others had the same hydrophobic and hydrophilic patterning as true designs but with random residue identities. By screening an unprecedented number of good and bad designs in high-throughput and carefully combing through the results, Gabe was able to shed light on what makes small computer-generated proteins really work. His success rate iteratively rose from 6 to 47 percent. He reported his findings in Science. 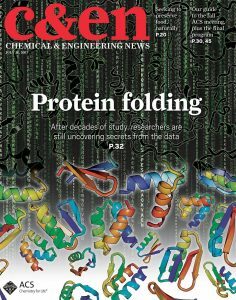 “Each designed protein is a new experiment revealing how properties like folding stability and binding affinity result from protein structure,” he explains. Gabe’s artwork also appeared on the cover of C&EN. “Creativity comes from being exposed to as many concepts as possible. I came from a lab that studies protein folding and one that does high-throughput screening. I had the background to see that this was an important question and go about analyzing the data,” Gabe says. His advice to other young scientists: think hard before selecting your own project. And change course when new opportunities come up. Be on the lookout for ways to bring new ideas and new technology to fundamental questions.